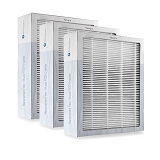 We offer only genuine Blueair Replacement Filters, no third party or off-brand replacement filters. Use Promo Code "ATEN" and save 10% on your purchase. Free Shipping. No Sales Tax. Blueair recommends replacing filters about every 6 months for optimum performance. Excellent choice for allergy and asthma sufferers. 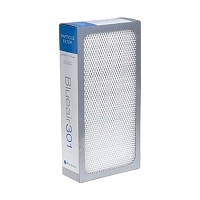 Insist on Genuine Blueair Replacement filters for your Blueair Air Purifier. We sell only Genuine Blueair HEPASilent Particle Filters and the new Dual Protection Replacement Filters for all BlueAir Series. If tobacco smoke or kitchen odors are a concern, choose to change your replacement filters to the new Dual Protection filters instead of the HEPASilent Particle Filters in any Blueair Air Purifier. 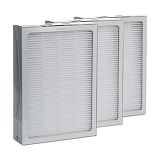 Why Blueair Replacement Filters work so Efficiently to Purify your air. 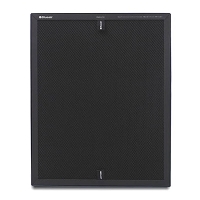 Blueair HepaSilent™ Filter Technology features the Blueair Progressive Filter. 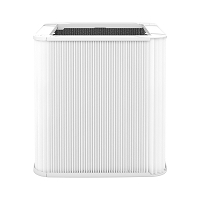 The Blueair Replacement Filter with the highly efficient built-in pre-filter, traps six times more dirt and particles than many other air purifiers and only genuine Blueair Replacement filters provide this exceptional performance. This is because of Blueair’s progressive filtration, by initially imparting an static electrical charge on incoming pollen, allergens, pet dander, mold spores, dust and other contaminants to permanently adhere to the millions of fibers deeper in the filter structure. 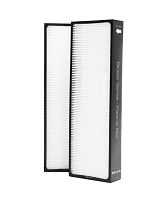 Most other filters have a thin layer of different size fibers throughout the filter. Blueair filters have millions of ultra thin fibers in three progressive layers. This Progressive Filter design resists premature clogging, the filters are made from a network of very fine hypo-allergenic fibers. This design permits much longer, continuous filtration at peak levels and helps extend the filter life. Because of this filter design air flows more freely through the filters. This is why Blueair units deliver more clean air at a faster rate with less noise than any other air purifier. First Layer: Large particles such as dust and pollen are captured in the first layer consisting of larger fibers. In this stage particles are electrically charged and trapped by direct contact with the filter fibers. Second Layer: This layer consists of a finer fibers that collect smaller particles such as bacteria and allergens. This layer of the filter intercepts the smaller particles that escaped the first layer. Third Layer: In this layer, much smaller particles like viruses, mold, pet dander and minute particles are filtered out. This layer consists of ultra-fine fibers, as small as 0.5 micron. Minute Particles enter this layer with an imparted negative charge and easily adhere stick to the fibers, thus capturing particles as small as 0.1 micron at 99.97% efficiency. The new Blueair DPF (Dual Protection Filter) efficiently removes micro-plastics, dust, mold, pet dander, viruses, bacteria, pollen and more. 99.97% of particles down to 0.1 microns. To put that in perspective 0.1 microns is 1/500th the diameter of a human hair. That's really tiny. And this filter does this without reducing the Clean Air Delivery Rate. 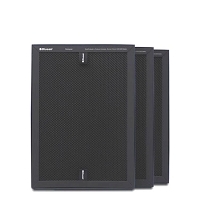 The Blueair Dual Protection Filter utilizes finely granulated activated activated coconut shell carbon. This renewable resource carbon efficiently removes gases and odors like traffic exhaust, smoke, cooking odors smog, airborne chemicals pet odors and more. Efficiently reducing these airborne contaminants up to 4 times faster than other carbon filters. With the natural capabilities of pure activated coconut shell carbon the new DPF filter needs no additional chemical additives. Just sustainably sourced high quality, high porosity coconut carbon. The new Blueair Dual Protection Filter combines high efficiency particle removal with the best gas and odor reduction filtration that Blueair has ever produced.